This is part 5 of building a trading system series. The idea has been to take one source of rapidly changing trading data and demonstrate the range, power and simplicity of applying dynamic data operators to it. Throughout the series I have made the assumption that the reader is already familiar and comfortable with the absolutely brilliant reactive extensions framework. For those who are not I strongly recommend to check them out. There is a steep learning curve but I assure anyone that once you start thinking reactive you will never turn back. You will probably wonder how you ever programmed without it. Also if you want to download the code which goes with this example, go to Trading Demo on GitHub and download and run in visual studio. Open the menu option labelled Trading Positions and you will see the following screen. This screen connects to the trade service data, groups by currency pair and aggregates the totals for each grouping of currency pairs. With dynamic data doing this becomes so simple with very little code involved as I am about to show. The starting point is to group the trade data by currency pair. This is achieved using dynamic data’s Group operator. //where tradeService is the trade service created in Part 1. This does not look like much but the group operator is very powerful indeed. As with all things reactive, changes in the trade service are automatically propagated to the appropriate grouping. Dynamic Data extends the reactive framework by accounting for adds, updates and removes. So when trades are created, closed or amended the groups will automatically reflect these changes. The grouping object creates a cache of each group and it’s signature is like this. Three generic types, a bit ugly I admit but we have a dynamic collection of caches, one for each item matching the group selector in the underlying data source. When grouping I almost always apply a transform function to do something with the group. In this example we want to aggregate totals for each group, so first I have created an object which accepts the grouping in it’s constructor and apply some dynamic aggregations on the cache. For this we need to use dynamic data’s Transform operator. This is akin to the standard reactive Select operator but as with several other operators in dynamic data I have to use an alternative semantic dues to ambiguous reference problems for extensions. For each change in the underlying cache the operator is invoked. The parameter exposes a querying API so the underling cache can be queried in a functional manner. The consumer must return a result which becomes an observable of whatever is returned. In this example we have used some standard linq to objects to calculate the buy and sell totals and return a new object which contains these values. We are at the point where we have a CurrencyPairPosition object which always reflects the latest position so the last things is to expand the consuming code so we can bind to the collection of these. This will maintain the sorted order and ensure that CurrencyPairPosition objects are disposed when no longer required. Now a little xaml bound to the data property can produce the screen at the top of the page. In summary, Dynamic Data makes the reactive management of collections of data very very easy indeed. If you look at the code list below, you will see just how little is involved. There are about 170 lines of code over three c# classes which also includes namespace and using declarations. And what’s even better is despite the underlying data rapidly moving, nowhere have I had to concern myself with thread safety and all the operators are completely thread-safe so long as all code functionally remains inside the operators. Although I have been blogging about dynamic data I have so far omitted any specific documentation. This is because dynamic data is functionally very rich and hence there is such a huge amount to document. Frankly with over 50 operators to explain I have been daunted. But at last I am on the case, so this is the beginning. The documents live on Dynamic data documents on GitHub and for the next month or two I will keep updating these. It is perhaps easiest to think of dynamic data as reactive extensions (rx) for collections but more accurately dynamic data is a bunch of rx operators based on the concept of an observable change set. The change set notifies listeners of any changes to an underlying source and has the following signature. where IChangeSet represents a set of adds, updates, removes and moves (for sort dependent operators). Each observer receives the changes, applies some logic and in turn notifies it’s own changeset. In this way complex chains of operators can easily be chained together. The only constraint of dynamic data is an object needs to have a key specified. This was a design choice right from the beginning as the internals of dynamic data need to identify any object and be able to look it up quickly and efficiently. To open up the world of dynamic data to any object, we need to feed the data into some mechanism which produces the observable change set. Unless you are creating a custom operator then there is no need to directly create one as there are several out of the box means of doing so. The easiest way is to feed directly into dynamic data from an standard rx observable. The problem with the above is the collection will grow forever so there are overloads to specify size limitation or expiry times (not shown). The cache produces an observable change set via it’s connect methods. This method is only recommended for simple queries which act only on the UI thread as ObservableCollection is not thread safe. One other point worth making here is any observable change set can be converted into a cache. This cache has the same connection methods as a source cache but is read only. Now you know how to create the source observable, here are some few quick fire examples. But first, what is the expected behaviour or any standard conventions? Simple answer to that one. All operators must comply with the Rx guidelines. When an observer subscribes the initial items of the underlying source always form the first batch of changes. Empty change sets should never be fired. In all of these examples the resulting sequences always exactly reflect the items is the cache. This is where the power of add, update and removes comes into it’s own as all the operations are maintained with no consumer based plumbing. Example 1: filters a stream of live trades, creates a proxy for each trade and orders the result by most recent first. As the source is modified the observable collection will automatically reflect changes. Oh and I forgot to say, TradeProxy is disposable and DisposeMany() ensures items are disposed when no longer part of the stream. Example 3: produces a stream which is grouped by status. If an item changes status it will be moved to the new group and when a group has no items the group will automatically be removed. Example 4: Suppose I am editing some trades and I have an observable on each trades which validates but I want to know when all items are valid then this will do the job. This operator flattens the observables and returns the combined state in one line of code. I love it. Example 5: will wire and un-wire items from the observable when they are added, updated or removed from the source. The above examples are just a brief glimpse of what dynamic data can do. It will all be documented in time. I have released DynamicData.ReactiveUI which is a very simple adaptor layer to assist with binding dynamic data observables with reactiveui’s ReactiveList object. To cut to the chase, here’s an example. The code takes existing in-memory trade objects, transforms them into a view model proxy and updates the target reactive list object with the resulting change sets. It also pre-filters the data with live trades, applies a user entered filter, orders the resulting data and disposes the proxy when no longer required. Phew – all that in effectively one line of code. 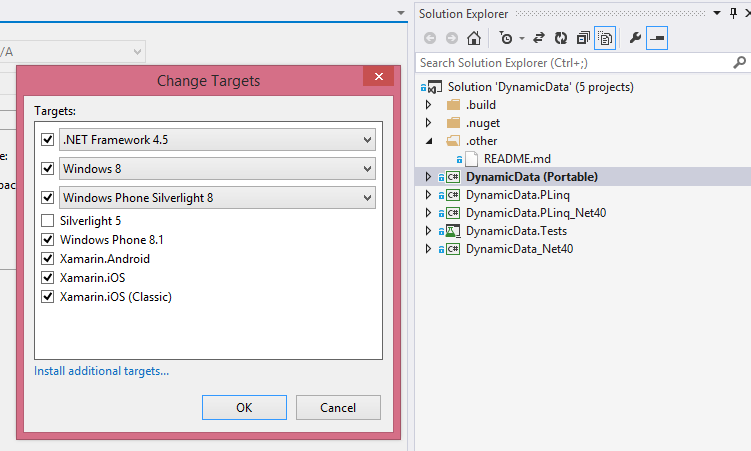 Dynamic data is now a portable class library available on most platforms. See below. Additionally there is a separate dotnet 4.0 library because I know there are enterprises out there stuck in the old days (investment banks maybe?). Now you can do some cool rx for collections stuff of WP8, IOS and Android as well as windows desktop and server. I will explain what the plinq assemblies enable in a post in the near future. Intrinsic to collection change notifications, items can be notified by add, update and remove events. If ordering is supported a collection will support a move notification. Of course Dynamic Data supports these. Yet something which is often overlooked is data or functions of data are sometimes by necessity mutable. How can a collection which notifies respond to mutable changes? Where PercentFromMarket is a calculation which is recalculated with each and every market data tick. Using standard linq a list of near to market trades can be retrieved as follows. The manifest problem with this query is it pull based only and has no means of observing when the market price has been recalculated, or alternatively how can re-evaluation be forced. Based on practical experience of dealing with this kind problem I introduced multiple means of injecting the evaluate command into a dynamic data stream. Here I will use a filter controller illustrated in a previous blog and we will apply it to the trade service here. In summary any of the controllers in dynamic data are used to inject commands and meta data into a stream. For this example we need a dynamic filter which is applied to a stream of trades. The filter controller has an overload to force re-evaluation. The only missing element is when do we invoke re-evalulation. We have 2 choices. Either the service which calculates market prices provides a notification of trades which have been re-calculated or we poll on a period. Option 1 would be suitable for algo trading where everything must happen preferably with zero latency but for simplicity in the example we will poll as follows. And that is that. We have a live stream of trades, where closed trades are automatically filtered out from the source and the filter controller constantly re-applies to ensure only trades near to the market are included in the result. And as ever what is beginning to become my catch phrase – that is easy! After wrapping the function into a cold observable, here’s the final code. This observable will form part of a future post where I want to build the foundation of an auto trading system. But for now, in a few lines of code (see NearToMarketViewer.cs) we can put the data onto the screen. I have been busy creating example code of how to use dynamic dynamic data yet this blog has fallen well behind the code. The demo now has 5 simple yet powerful examples with a 6th in mind. The problem is I love being creative with code too much to be spending my time writing about it. With new years on the way perhaps a resolution is required. Although I am no designer I like systems to look good. After all during the development cycle F5 can be pressed tens of thousands of times so I have taken the trouble to apply some styles. A big thanks to MahApps for their awesome wpf library and to Dragablz for creating Chrome style draggable tabs. As you can see from the image, the menu page has hyperlinks to the code behind and to this blog. Hopefully this will give a coherent means of seeing how the data on the screen matches up with the code. This is the third part of the trading example series. If you are not already familiar with the previous parts they are, part 1 is here and part 2 here. Also a fully working demo project is here. Since publishing part 2 I have embellished the sample code to make it look more production like so if you previously downloaded it I suggest you download it again. So far we have created a trade service and a job which updates the market prices. Now I am going to demonstrate how dynamic data can help to present the data onto a WPF screen. A filter controller as I want the user to be able to search for trades by entering some text. 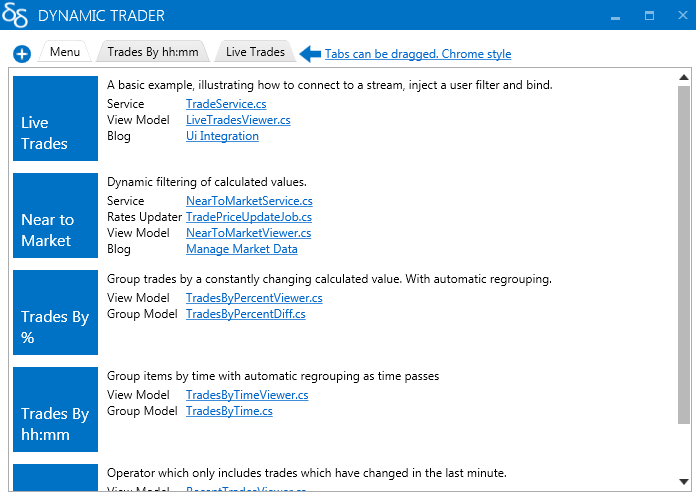 A proxy to the Trade object as the market price changes and WPF requires an INotifyPropertyChanged invocation. which is optimised for binding dynamic streams. If however you choose to use the standard observable collection or the one provided by ReactiveUI, you can but will have to write you own operator to update the bindings. I will discuss how to in a future post. Finally we need a simple proxy of the trade object. With these elements in place we can now easily get data from the trade service, filter it, convert it to a proxy, bind to an observable collection and dispose the proxy when it is no longer required. I will not explain the xaml required as this is beyond dynamic data. But a few lines of xaml bound to the result of observable collection can give this. Was that easy? Take a look at the source code LiveTradesViewer.cs. 80 lines of code including white space. All I say now is don’t tell your boss that you can do all this in a few lines of code otherwise you may have a pay cut!